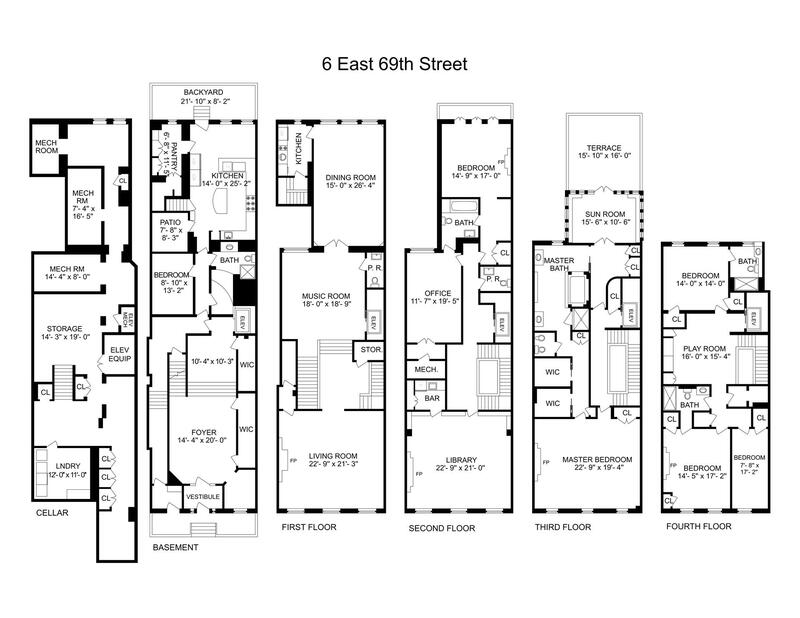 The classic neo-Federal 25'-wide mansion at 6 East 69th Street has approximately 12,000 interior square feet on 6 levels with 17 rooms, 6 bedrooms, 5 baths, 2 powder rooms, 4 fireplaces and elevator. It features large rooms, high ceilings and abundant natural light. Stairs from the grand entrance foyer lead to a noble parlor floor consisting of living room with fireplace, music room, dining room and powder room. The third floor features a beautiful paneled library with fireplace. The fourth floor master suite includes a large bedroom with fireplace, two large walk-in closets, a huge marble master bath and sun room in 1,800 square feet plus a 250 square foot south-facing terrace. The fifth floor has three bedrooms, two baths and a play room. It is rare to find a home of such scale and quality in the best possible Gold Coast location adjacent to Central Park, world class museums and highly acclaimed Madison Avenue shops and restaurants.